Starting Again | Bite Me. I feel like I’ve medically travelled backwards, and I’m on my first few weeks of IV meds, in Connecticut in the fall of 2008. Thank god I’m not as sick as I was back then (high-five for me for having no seizures or black outs! life is so much less exciting now for everyone else around me hahaha). Every drop of medication makes my head hurt and my chest have this weird feeling kind of like heart-burn, if heart-burn was in your literal heart. I know I’m slurring and tripping over words, the wrong phrases mix themselves together and every now and again the wrong fiddle comes out of my ear (fiddle…word….ear…mouth, same difference! work with me here.). I continually make simple errors, and cannot understand some sentences. I’m dropping out and tuning out (and I’m not even on those kinds of drugs!). I even sent out the complete wrong size DryPRO PICC protector (a cover for your IV line when showering) to a customer, which I still feel dreadful about. In the past, when I’ve been on the IV drugs and the rest of my brain was acting like melting cheeze, it corresponded to a serious drop in my energy level. So I’d be loony and unable to focus, and stuck on the proverbial couch. Not so this time. Is it all the spirulina I’ve been taking? Maybe. Wait, no, it’d better be, because that stuff don’t taste the best if ya know what I mean. I’m not sure, but I’ve still been acting moderately peppy, even though I haven’t been sleeping well, and have been really busy. Meeting with friends, going for walks (or sojourns into nature involving me being pushed around), knitting, sewing, music, repeat. 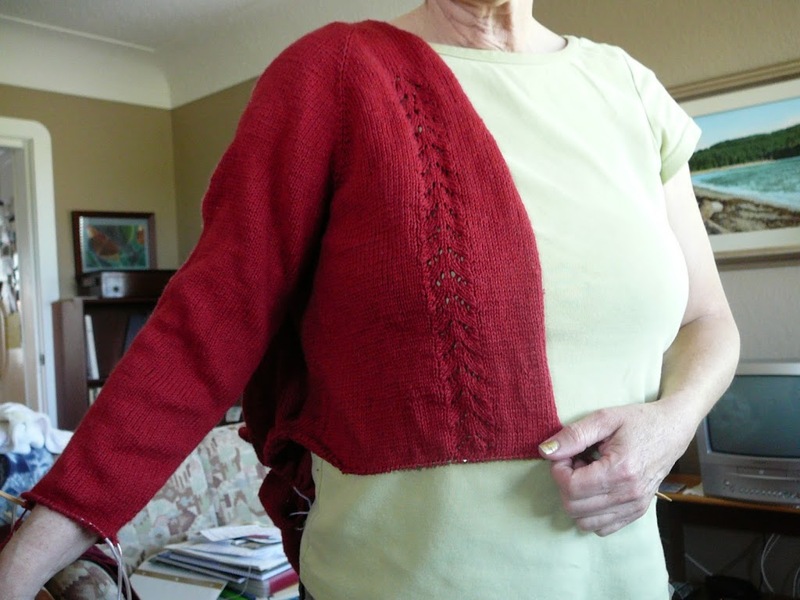 I’ve been making a sweater for my amazing Mama in luscious red Organic cotton. 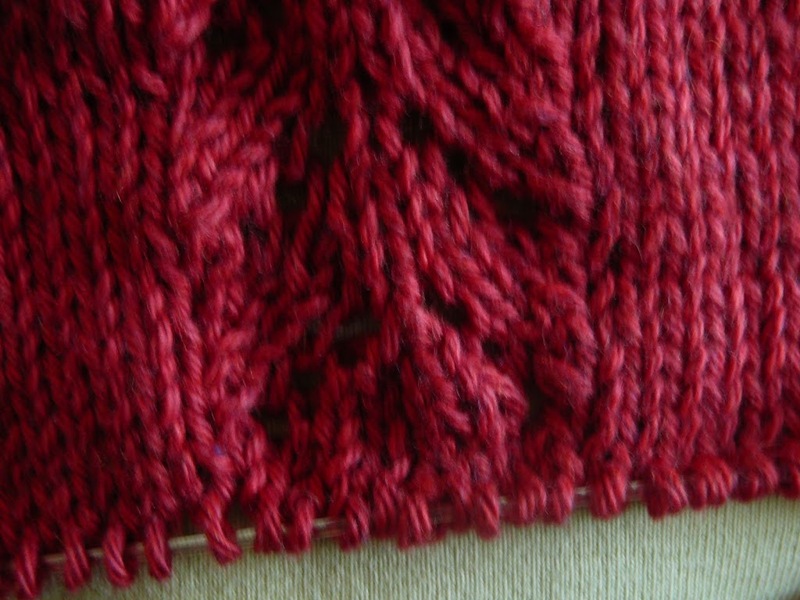 A touch of lace, a touch of shaping, my raglan design…all the makings of a fantastic garment! We’ve been planning the last minute details to our trip to Ottawa too. We’ll be meeting with as many MP’s as will see us, so I’ll be needing all my stores of peppiness in the coming weeks. Hopefully, we’ll be able to convince the MP’s we meet to vote ‘Yes!’ with a capital Y and an exclamation point on Elizabeth May’s private members bill on creating a “National Lyme Disease Strategy“. My fellow Canadians, have you talked to your MP about voting ‘yes’? I urge you to share your story (or the story of a friend/family member with Lyme disease) with your MP’s and make it clear to them that you support this bill, and change on this issue. There are undoubtably constituents in every riding across the country with Lyme disease, and if just a fraction of us visit our MP’s and even more people write to their Members of Parliament, we’ll be well on our way to creating change for all Canadians, present and future, battling Lyme Disease. Wishing you all the best in this new phase of treatment! How great that you have the strength to travel to Ottawa….again! Thank you for all of your efforts. The NDP MP in one of our city’s ridings said that the NDP will be supporting Elizabeth May’s bill, which is great. Do you know when the vote will be taking place? thanks paula. i am so excited…about the trip and treatment lol. the vote will take place sometime after it is debated. the government is very ‘free form’ shall we say, and it could come up for a vote sometime in the winter or new year, or maybe longer. the idea is we get support now, so when it does come up for a vote, it will be a no-brainer for the MP’s to want to vote “yes”!